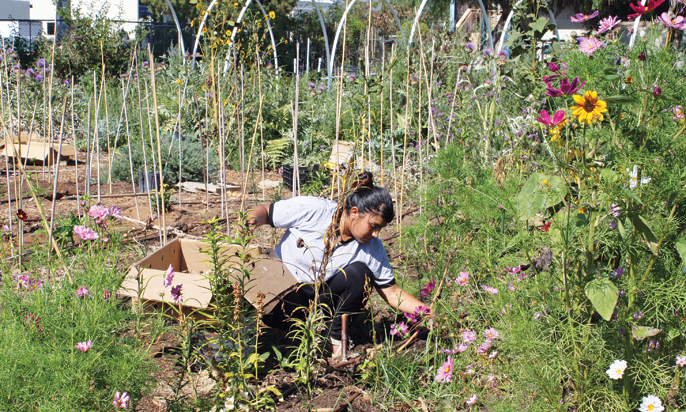 Alondra Suaste tends to flower beds at Muir Ranch, a two-acre urban farm on the campus of John Muir High School. Among the rows of sunflowers and fresh herbs, patches of zucchini, tomatoes and chard burst from the ground. Butterflies flutter between colorful zinnias, lizards scamper across sun-warmed soil, bees buzz about and the fragrance of roses wafts through the air. 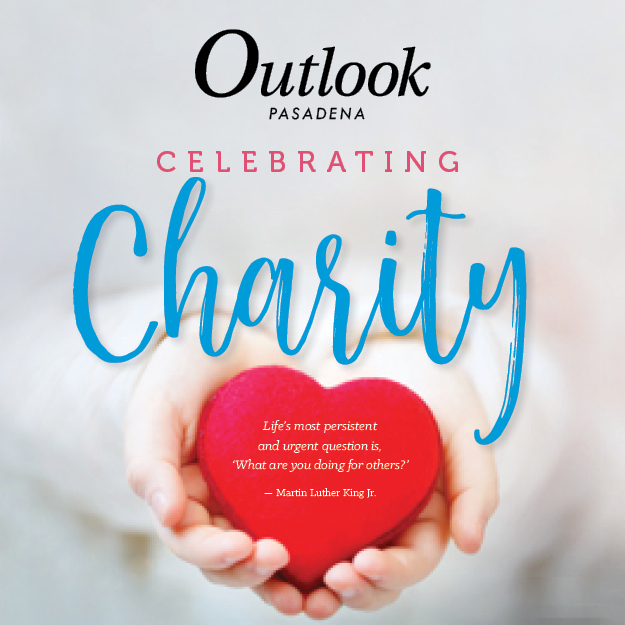 Sometimes, change sprouts from the most unexpected places, and in northwest Pasadena, on two acres sandwiched between John Muir High School and the 210 freeway, is a flourishing urban garden, where knowledge is cultivated, hidden talents are unearthed and futures begin to blossom. 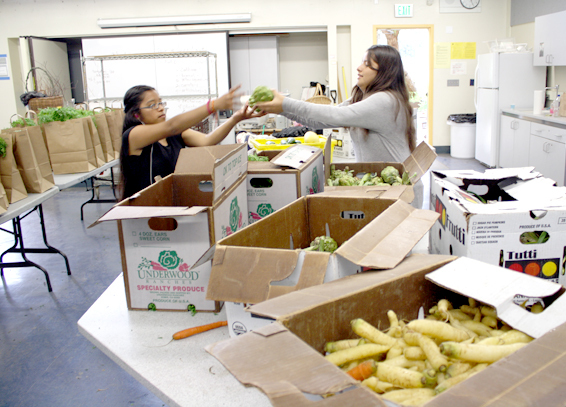 Mariela Cortez and Jahaira Ruiz help fill orders for Muir Ranch’s Community Supported Agriculture program. In addition to produce from the ranch, CSA boxes are supplemented with discounted “ugly” produce from local farmers. “We’re a teen jobs program that looks like a school farm,” explained “Mud” Baron, the aptly named master gardener and executive director of Muir Ranch. For the past four years, Baron has taught students at Muir how to plant, grow and harvest their own food and flowers. They’ve learned how to till soil, to cast worms, when to water and when not to. They’ve learned to arrange and sell bouquets, manage orders and work with clients. If they can endure the sun, sweat and dirt, and they keep coming back, they get a paycheck out of it. Before it had a name, Muir Ranch started with a few flower beds in an empty lot — the brainchild of Doss Jones, a retired Muir science teacher with a vision for an outdoor classroom. With administrative approval and a grant from Pasadena Water and Power, Jones worked with Shirly Barrett, facilities grounds coordinator for Pasadena Unified School District, to build a small drought-tolerant garden behind the campus. Jones met Baron, who’d previously worked as a school gardens consultant and green policy deputy for L.A. Unified School District, through a master gardening course, and in 2011, brought him on to help shape the space into what it is today. It wasn’t surprising that the allure of nature that brought students to the ranch in the beginning. 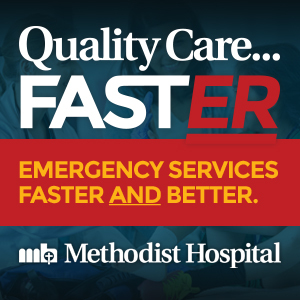 Many were filling elective requirements or recovering credits. Others used it as an excuse to get out of gym class or complete detention. Even for those who chose to be there, doing manual labor in the hot sun felt a lot like punishment. As he spent more time in the garden, however, Garcia’s attitude started to shift. Under Baron’s mentorship, he began to learn by doing, taking an interest in subjects that never held his attention in the classroom. 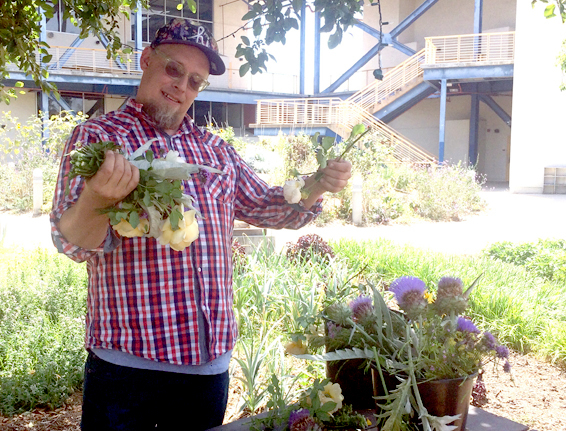 Mud Baron, executive director of Muir Ranch, arranges a one-of-a-kind bouquet for a client. For fellow alumna Alondra Suaste, who chose the ranch as an elective shortly after its launch in 2011, it was the sense of comradery that kept her around. Both Suaste and Garcia have since graduated and are now paid employees of Muir Ranch, running the flower department that helps sustain the program through farmers’ market sales, weddings and private events. Additional income is brought in by Muir’s tax-deductible community supported agriculture program, which has about 75 weekly subscribers. Throughout the year, Muir Ranch also partners with local chefs and restaurants to host farm-to-table dinners in the garden, raising funds for the program while highlighting the students’ harvest in professionally prepared dishes. All of this is helping to shape the way students think and feel about the food they eat. By growing their own food, students form a personal connection with it, gaining a deeper understanding of the journey from seed to plate. That’s not to say all of the kids at Muir are ready to abandon their Flaming Hot Cheetos. In changing students’ attitudes, one can’t ignore the reality of his/her surroundings, and at Muir High School, it’s not all sunshine and roses. Many of Muir’s students are dealing with much bigger issues — 86% are on free or reduced lunch, while 23% live in group homes or foster care. Paid internships are available to Muir students who work on the farm during summer break or outside of class hours during the school year. Students start out on a volunteer basis, and after two weeks, they’re added to the payroll. For many with no previous job experience, working at Muir Ranch offers not only a steady part-time income, but also enhances their post-high school employment prospects. Not all of Baron’s prodigies will become farmers. Suaste eventually plans to move on and get a nursing degree, though she says she’ll stay involved with the ranch in her spare time. The green-thumbed Garcia, however, is convinced he’s found his calling. Having learned about water conservation and worked with drip irrigation systems at Muir Ranch, the enterprising 20-year-old sees opportunities for a career in water-wise landscaping, particularly as California’s drought continues to worsen. Aside from developing problem-solving, communication, customer service and business management skills, at Muir Ranch, students learn responsibility, teamwork, initiative and self-reliance. Perhaps most important, they learn to be leaders, finding a sense of purpose in the garden — whether they’re looking for it or not.